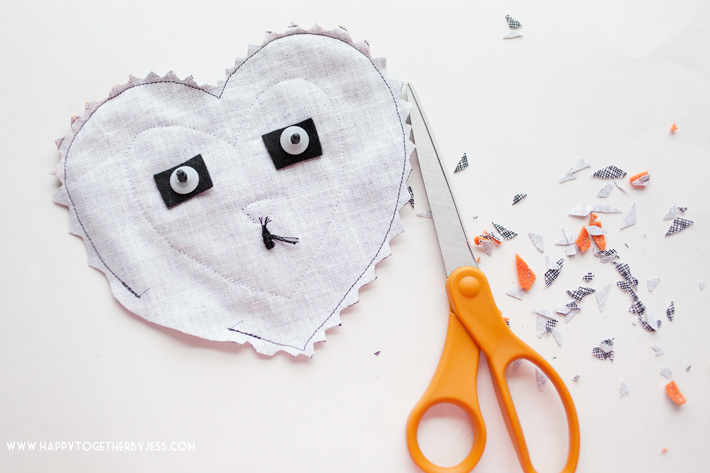 Here is a free heart animals pattern for you to use in honor of Valentines Day, which is so close! 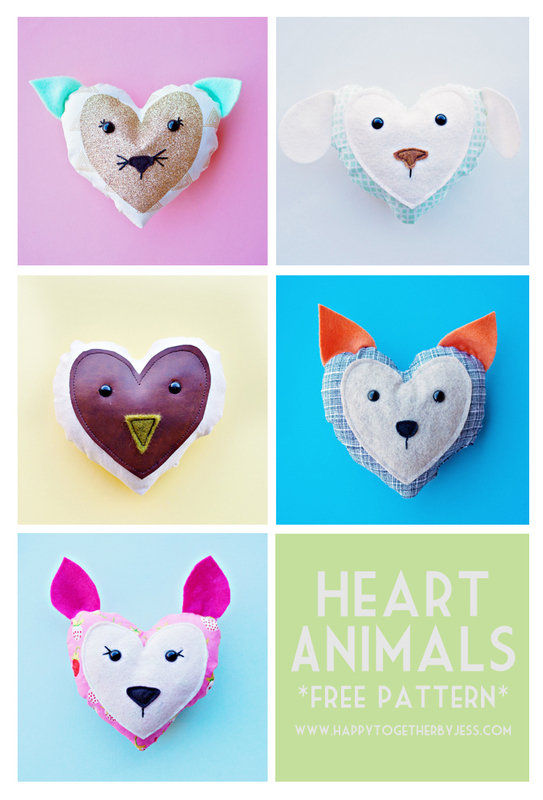 Of course, these heart animals are for any time of the year really, but are inspired by this love filled holiday. 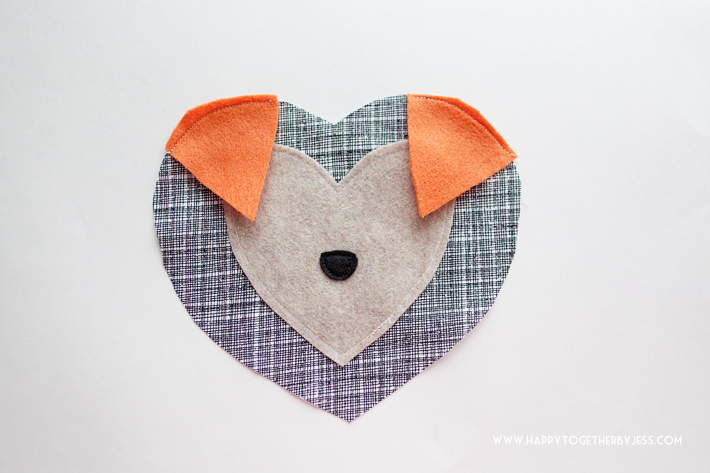 Felt or Other None Fraying Fabrics (like leather/faux leather, fleece, iron on vinyl, etc) for faces, noses, and ears. 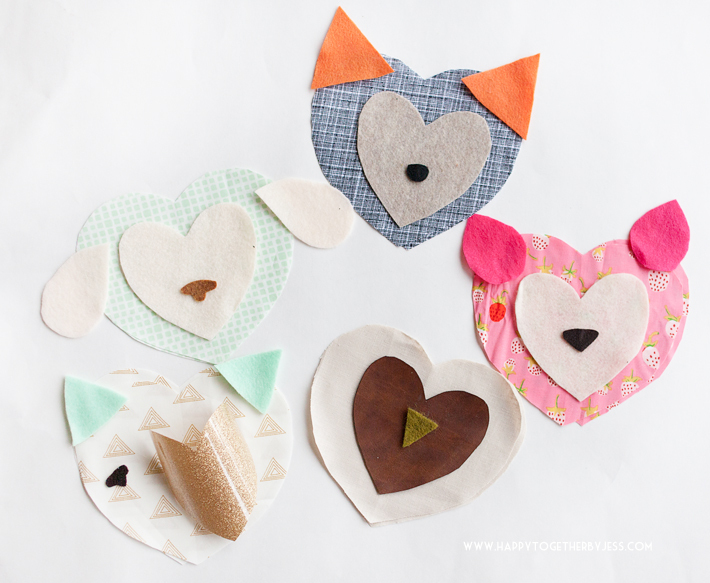 Start by cutting out your pattern and using that to cut out the pieces from your chosen materials. The pattern pieces have how many of each you will need to cut. As you can see I used all kinds of stuff I had on hand. 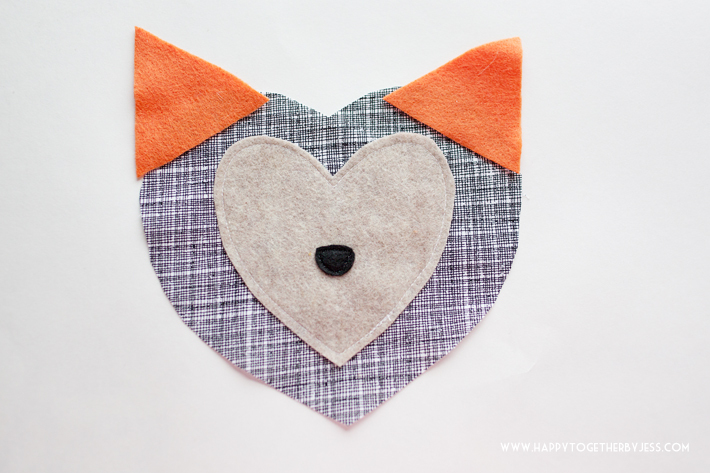 I use mostly cottons for the body but did use a linen fabric on the owl. I used acrylic felt mostly for faces and ears, but also used wool felt, fleece, faux leather from a purse I had cut up, and iron on vinyl. 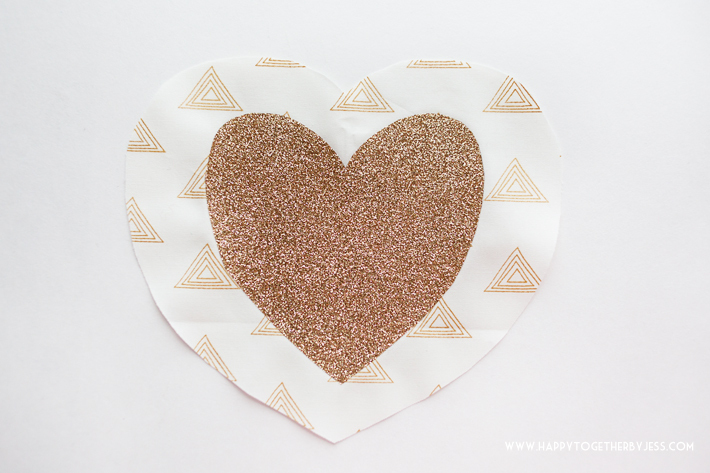 Iron your main heart fabric. 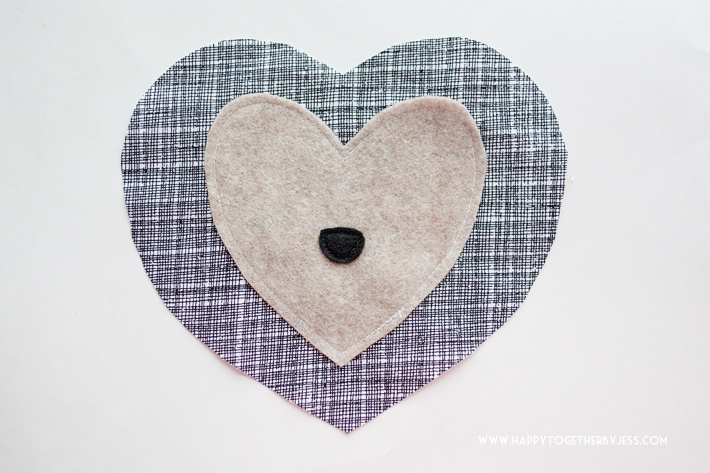 If you need to iron felt, I suggest placing fabric on top of it before pressing. 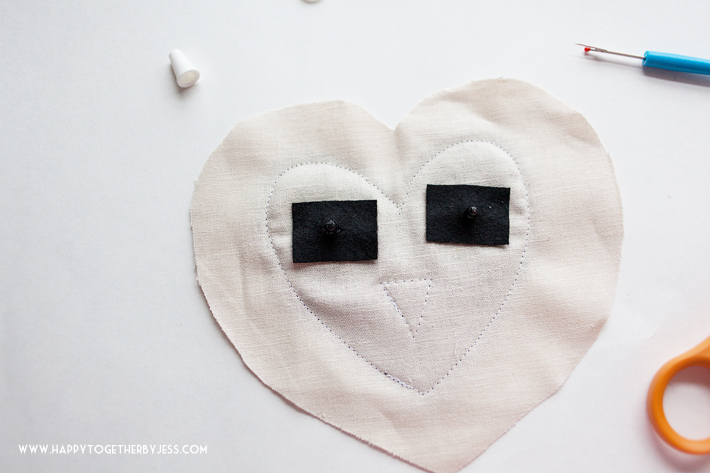 Then place the heart face on top middle of a heart body piece and sew in place. If you are using iron on vinyl, you can iron that on now. 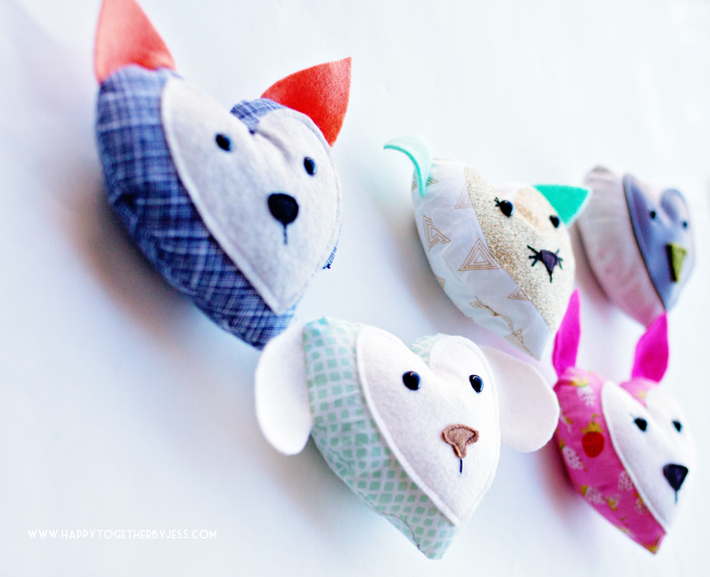 If your animal has ears, place them where you would like them. Then fold them down and pin in place. Sew very close to the edge just to keep them in place. 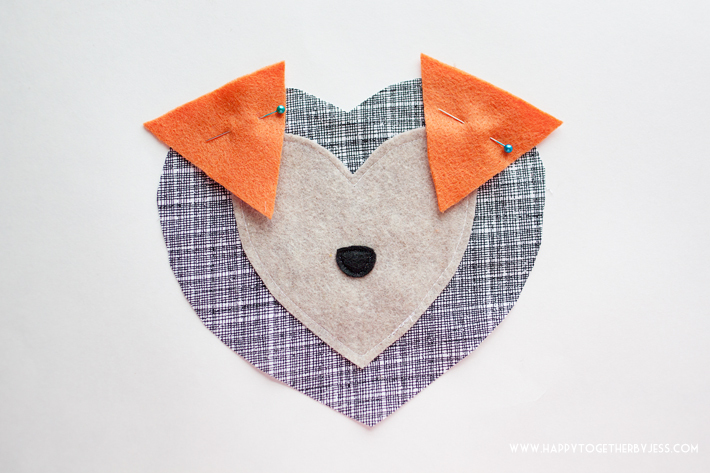 Note: If you are making a deer, you will need to pinch the rounded bottom and sew in place. Now place your eyes on. 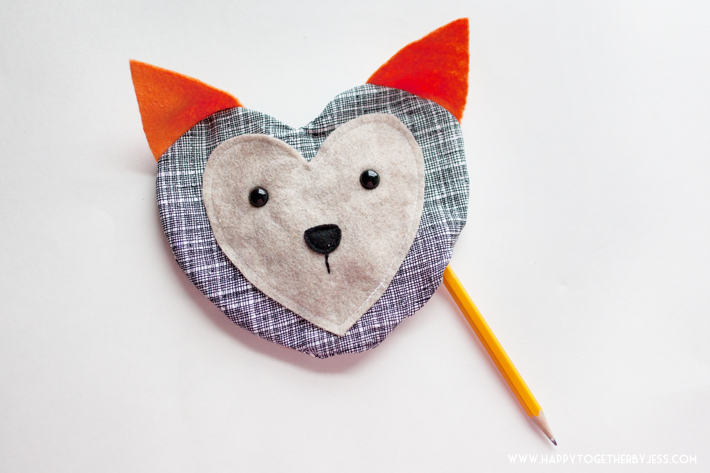 You can sew on felt circles or embroider eyes if this is for a little one. Other wise, add the safety eyes. Mark where they are to go. 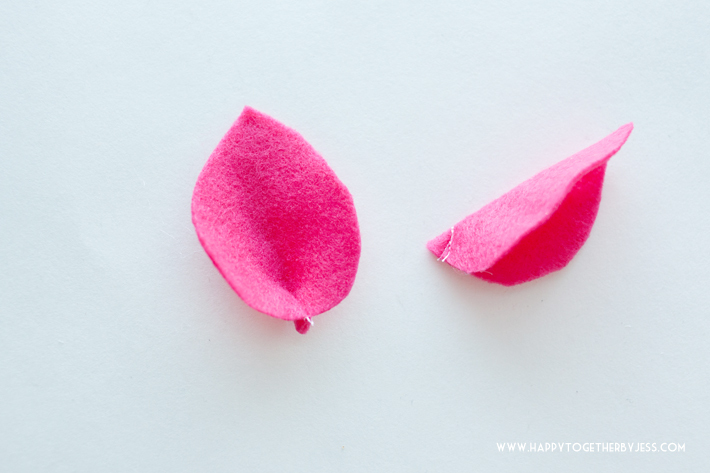 Use a seam ripper to cut just enough of an opening for the eyes to go through. On the back, add some glue around the opening. 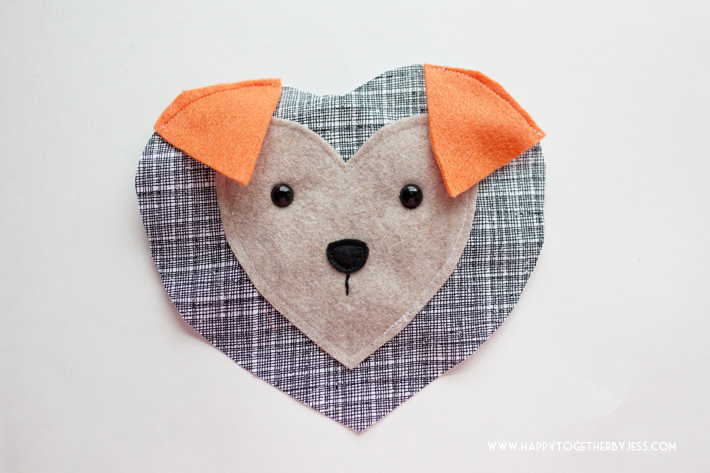 Cut a small piece of felt and cut a slit in the middle. 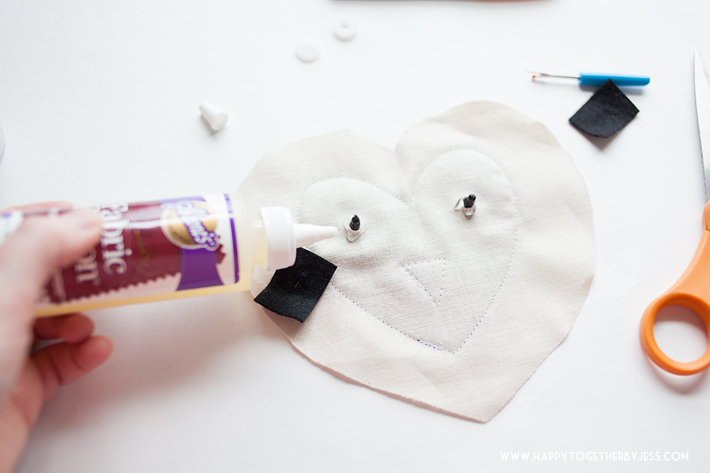 Place the eye piece through the felt and let the glue dry this in place. Add the plastic eye backing. Note: I have used safety eyes a lot and find adding the glue and felt helps keep it even more secure. Next embroider on any features you would like to add such as a mouth, eye lashes, whiskers, etc. 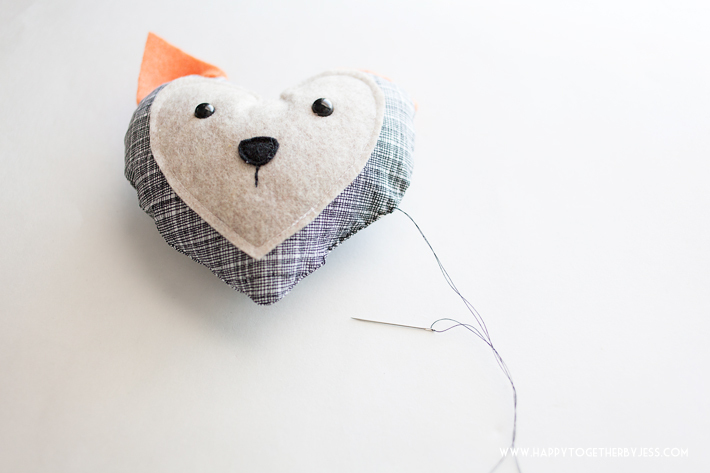 and place the heart back on top, right sides facing, and pin in place. 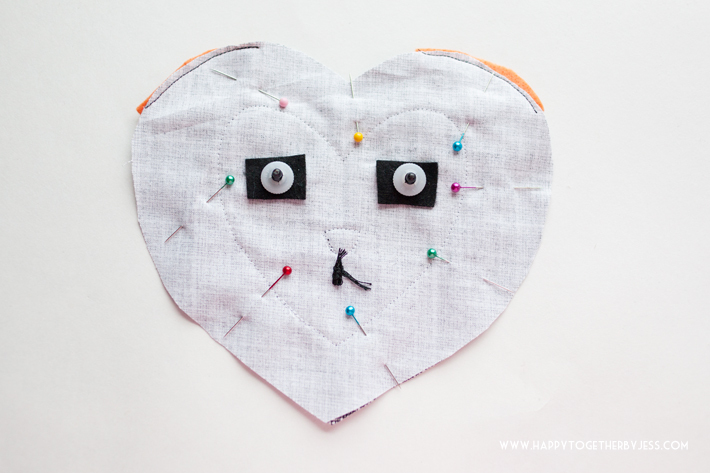 I suggest doing it with the eyes up as it’s easier to sew and remove pins this way. 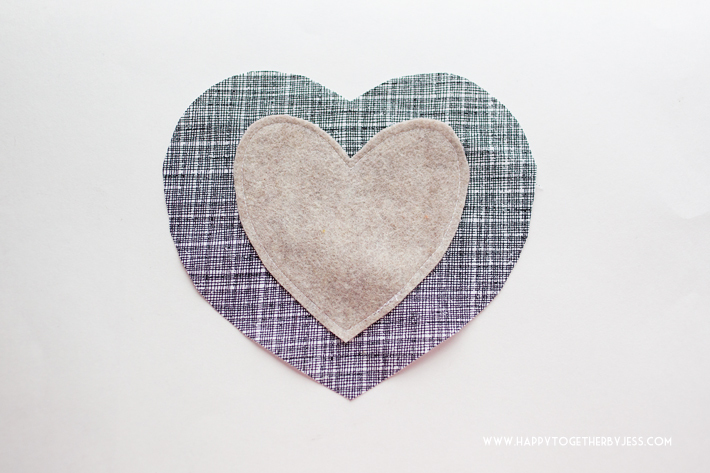 Sew all around the heart (1/4″ seam allowance, which is included in pattern) except to leave a small opening big enough to turn the heart right side out. 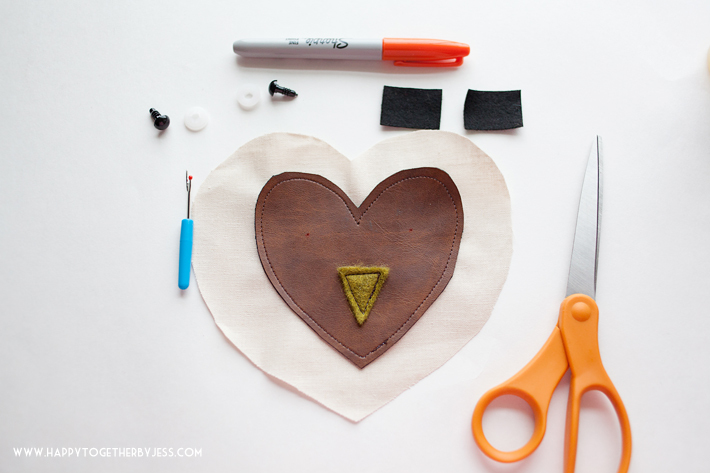 Trim notches around the curves of the heart shape. Turn right side out and push at seams to make sure it is all out. 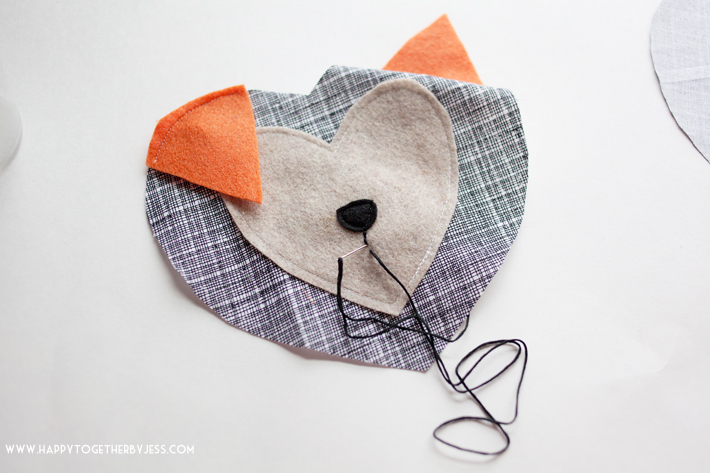 Fill the heart animal with stuffing until desired size is achieved. 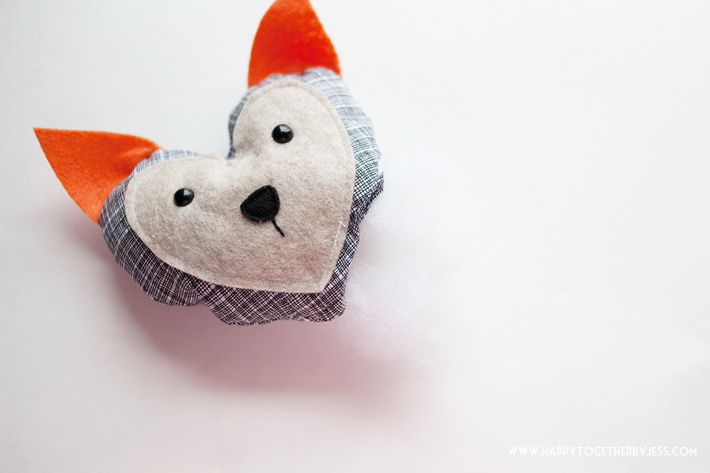 Now you have a cute little heart animal! 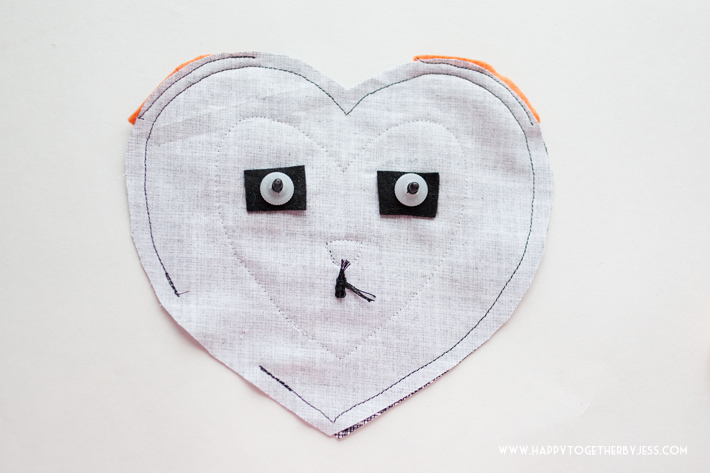 I hope you enjoy this free heart animals pattern. 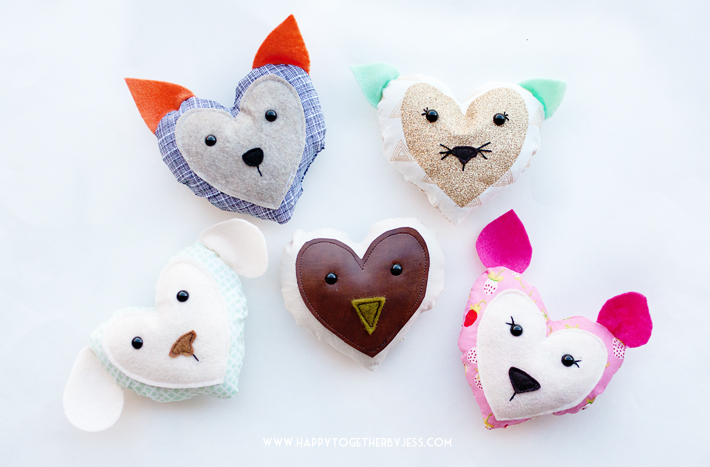 Share pics on the Happy Together facebook page or use #happytogetherbyjess on social media to share your creation.